The main mission of the DPS Student Transportation Unit is the certification and renewal of school bus drivers. 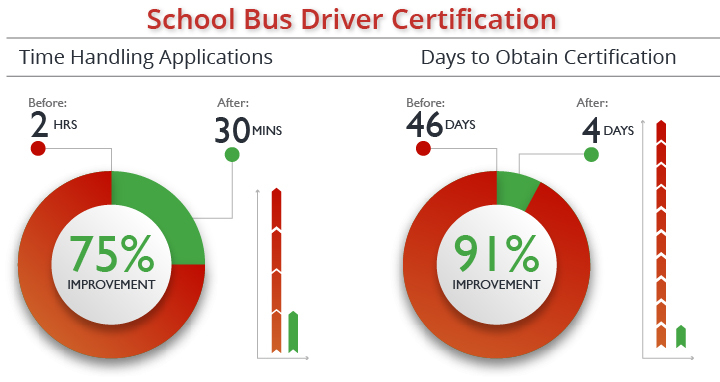 More than 1,290 bus driver certifications are given annually. The process to certify drivers was taking 46 days. Internally it was taking DPS staff 2 hours to process each application. In an effort to improve efficiencies in the application process, DPS broke the application into two phases, A and B. Applications missing items will no longer be placed into an “open” status, rather they will be set aside and the team will coordinate with the applicant to retrieve the missing documentation. Once the required documents are submitted, the application is considered “received” and the team works to process the application immediately. In addition to changing the application process, DPS put the necessary forms and information in centralized locations on their website, and created a checklist of necessary items that applicants must need to know prior to submitting their application. As a result of the improvements, it now takes just 4 days to obtain certification, a 91% improvement. Internal employee handling of applications dropped from two hours per application to less than 30 minutes, a 75% improvement.